When I think of my grandmother I still see her as she was years ago: true red lipstick, short black hair with perfect waves of curls pinned back, clip-on costume earrings, and black pumps. So classic. She is 91 years old now and no color other than natural has been on her lips in years. Her curls have turned gray, earrings are only worn on very special occasions, and pumps have been replaced by flats for nearly a decade. But to me, she is still beautiful. She is timeless. A few days ago (Wednesday) my father called me to inform me that she had fallen and broke her leg…as many elderly do. She was to have surgery the next day. As she lives a few hours away, and I am nearly overwhelmed with work and school, I wouldn’t be making a trip. The expected outcome of the situation was overall positive. Last year, around the holidays, over a period of a month or so, she suffered 4 strokes. 4! Many people don’t even survive one but this woman is unlike any other. She had been living on her own, but in order to be released after the 4th stroke the Doctor stated she had to live in either Assisted Living or a Nursing Home. So, we as a family spent the next 3 weekends in a row finding a new home for her, packing, cleaning, moving and unpacking her life. Those 2 months were terrible. As a child growing up in a single parent home, it was my grandparents who raised me much of the time while my father worked overtime each week and returned to school. The thought of losing the woman who raised me, my true mother figure, was devastating. I understand reality and the worst part about life is that it always ends in death. Yet I think nothing can truly prepare you. Well we made it through that and soon she returned to her quirky, perfect self. So her surgery and initial recovery went as well as possible, and we were informed she would have to stay in the rehab section of a nursing home for at least a month, with the possibility the nursing home could become a permanent residence, but still, a near-full recovery was expected. So I went on with my next day and a half as usual, finally sleeping again and the anxiety attacks subsided. Until the other evening (Friday), my father calls as I am driving home from work and says, “Grandma’s checking out”. WHAT. THE. HELL??!? With all the pain and weakness and remembrance of her health issues over the past year, she was somewhere in between acceptance and giving up. So she had called my father to say goodbye, and he told me to call her. So I instantly did. While still driving. Which I don’t remember, and DO NOT recommend (seriously, while crying and saying your supposed last words to a loved one, pull over.). We had a 15 minute conversation which I will never forget and will mostly keep sacred to myself. But it was the most heartbreakingly beautiful conversation I could ever ask for. Being told she loved me, she was proud of me, was lucky to have had me…it almost took the pain away for a moment. Not many people get the opportunity to have that moment with a dying loved one. A treasure more priceless than any physical object or any experience. I had flashbacks of her putting on her red lipstick and chunky earrings. Flashbacks of her making macaroni and cheese. Flashbacks of her playing “Go Fish” with me. We said “I love you” for the 50th time that conversation, and then “Goodbye” for the seemingly last time. Cue hyperventilation and more sobbing. While still driving home. Cue a night with zero sleep and a never-ending anxiety attack. Cue nausea. Cue returning to prayer since…I don’t know when. Cue a piece of my heart dying, and wishing that it could be my heart instead of hers. The next morning my father called and said she had made it through the night and was considered stable. Move forward one more day and she is finally starting to eat and sit up. She is asking for visitors and hasn’t talked about death in awhile. Move forward one more day and she is determined to get better and make it through this. To go to rehab and return to her assisted living afterwards. This beautifully strong woman seems to have pulled through again. But this time, we really do realize we won’t get many, if any, more opportunities like this. You may not get the chance to say “goodbye” or “I love you” to or hear it from someone who is dying, and you someday will be the one falling asleep. So, so cliché yet so true, say it whenever possible. And if it is truly meant and shown, there is no such thing as saying it too much. Give as much love as you can to those you love. You truly do not know when the last moment is. 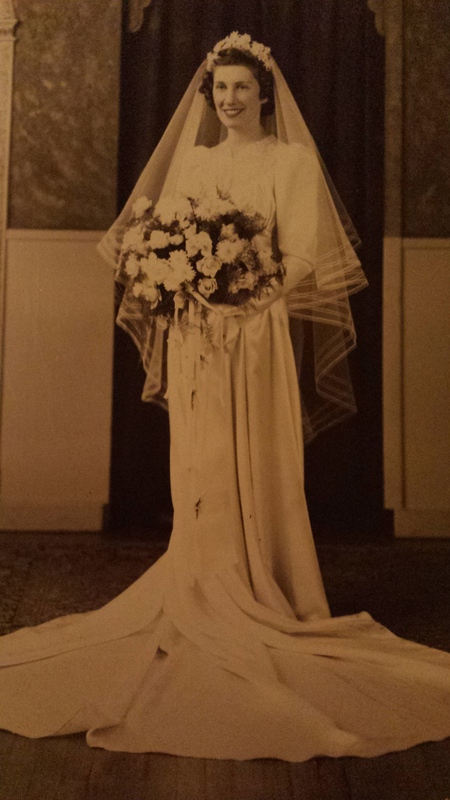 My beautiful Grandmother on her wedding day. To this day she is just as perfect.